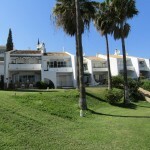 Riviera del Sol is located right between La Cala de Mijas and Calahonda. Find here apartments and houses for sale in this very popular part of Mijas Costa. Over the last few years Riviera del Sol has become a hugely popular destination for British holidaymakers and for those looking to move to the Costa del Sol and this is reflected by the amount of developments there are here now. On the coast between Marbella and Fuengirola Riviera del Sol urbanization is situated only a few minutes from the new E-15 motorway access, and the national coast road the N-340. Riviera del Sol runs down to the beach and is adjacent to Calahonda. Riviera del Sol is a mixed residential and holiday area enjoying every facility and services needed to enjoy life comfortably. Banks, restaurants, shops, supermarket, chemist and a health centre are all to hand.. Within the Riviera del Sol urbanization you will find Miraflores golf. Close buy you will also find Cabopino golf and Calahonda golf course. In Riviera there are several small stores, restaurants, bar etc within easy distance of your apartment or villa. The shops are opposite a very peaceful and popular park (Princess Diana Park) and gardens. Also they just also built a new supermarket (Opencor) on the corner adjacent to the entrance to Riviera. The Riviera Plaza opened at the beginning of July 2005, being built on the site of the old Cayetano supermarket and bar. It is an excellent facility for those of us who holiday and live in Riviera and sits on the main road through Riviera del Sol. It hosts a number of retail outlets, cafe/bar and a supermarket in the basement, as well as toilet facilities. The Plaza is open 9.00am - 9.30pm Monday - Saturday and is closed on a Sunday. Centro Comercial is a small complex consisting of the Miraflores supermarket, a hardware shop and other associated businesses and restaurants.